A hot plate is incredibly useful, whether you’re traveling, entertaining, or living in a dorm or other room without a full kitchen. With a hot plate, you can cook a meal, keep dip or soup warm throughout the course of a party or game, or easily reheat a dish while you’re on the go. 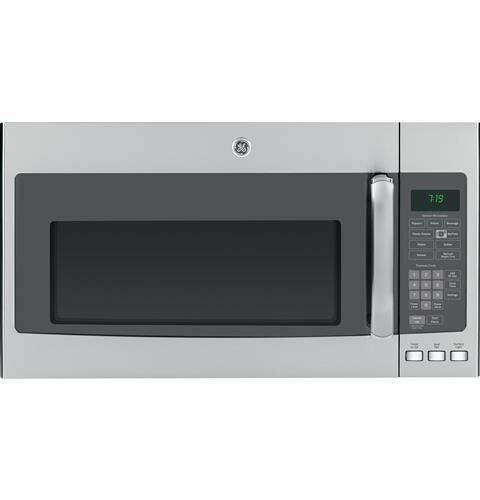 While most people are familiar with how a hot plate functions, heating technology has evolved significantly in recent years, so it’s now possible to find a wide array of hot plates incorporating technology like induction or high-wattage burners to heat and cook food more effectively than older models. Read more about our methodology. For everyday or occasional use, this efficient, low-profile hot plate both heats up and cools down quickly. An LCD screen makes temperature adjustments easy, while a glass surface simplifies cleanup. This professional-grade burner takes some time to heat up, but will provide steady and even heat throughout the day, even at higher temperatures. It’s also solidly designed and built for portability. This simple hot plate uses a coil that heats up quickly and provides enough heat to take on almost any cooking job. It also offers a number of safety features, which is somewhat surprising considering its price. If you’re looking for an affordable hot plate that doesn’t use a coil design, this solid-top hot plate is a great choice, providing even heat and an ample cooking surface. This high-performance double burner uses cast iron heating elements to deliver even heat, with versatile, higher- and lower-wattage heating elements that can fully cook food or maintain a steady temperature. If you’re looking for an effective and low-maintenance double burner, this hot plate incorporates larger-sized glass cooking surfaces that provide reliable, even heat and allow for easy cleanup. If you use iron or steel pots and pans, this induction cooktop is quicker and more efficient alternative to a standard electric hot plate. 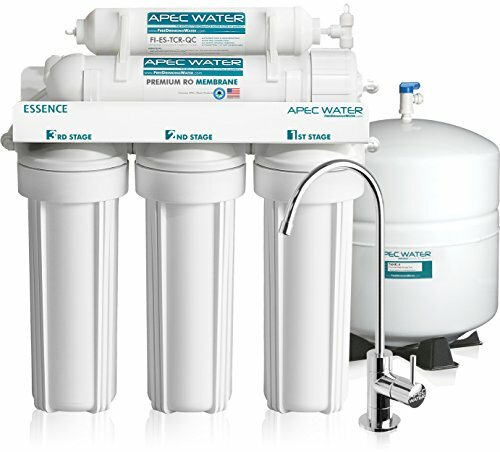 It also offers users exceptional performance, customization, and control. If you’re looking for a larger-capacity induction hot plate, this powerful double burner is a great addition to your kitchen. It has several settings that may take some time to figure out, but provides precise temperature control and fast cooking. The primary consideration when buying a hot plate is the wattage of the heating element. This will determine a lot of how you can successfully use a particular hot plate, since generally, higher-wattage hot plates will be better for fully cooking meals or boiling water. If a hot plate’s wattage is too high, however, you have a much greater chance of accidentally burning food, and you may find yourself wasting power or heat. While all hot plates use electricity to produce heat, buyers now have several options when it comes to heat sources. Ceramic and metal coils tend to be the most common, but glass hot plates with glass surfaces have increased in popularity in recent years. Induction burners are also widely available: these use magnetic fields to conduct heat, but only work with iron-based cookware. If you’re planning to travel with a hot plate, then portability is an important factor. A double-burner model, for example, will take up a lot more space in a vehicle or suitcase. A ceramic coil model of hot plate might resist breakage in transit, but is also significantly heavier than other models; a glass-top burner may be more prone to damage, but is lightweight and compact enough to fit almost anywhere. The ability to carefully control temperature is another important consideration when purchasing a hot plate. This can largely depend on both the heating source and wattage of a hot plate, but generally you should look for a hot plate that won’t overheat or take too long to warm up. If you’re purchasing a double-burner model, you might consider a model with a larger burner for boiling water or fully cooking a one-pot meal, along with a small burner for keeping dishes warm. Hot plate prices can vary from about $10 to upwards of $200, depending on the size, wattage, and technology of a particular model. Most hot plates in the $10 to $20 range resemble burners from electric stovetops and work in a very similar manner, using electricity to heat the coil (or coils). Most of these lower-priced models are not very efficient, however, and tend to use a lot of electricity while losing a lot of heat. In the $50 to $100 range, you’ll find more efficient hot plates, including glass-top models, cast iron burners, and some induction burners. Here, there’s a great deal of variety when it comes to styles, but you can expect relatively straightforward design and decent control over individual or double heating elements. At the $150 and above range, you can find extremely efficient and well-designed hot plates, including induction double-burners and commercial-grade models made for catering and other food service applications. These models can easily stretch into the $300 range, which is probably more than most consumers want to spend on a hot plate. 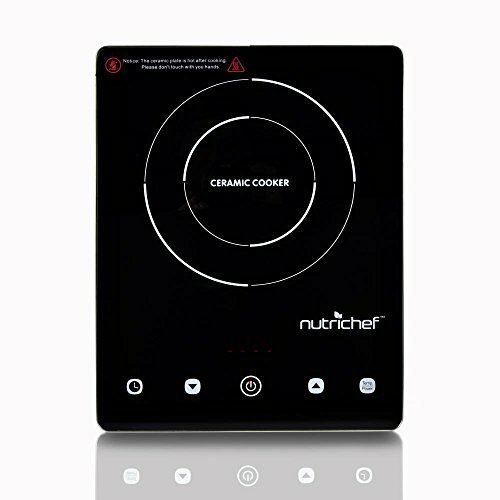 NutriChef’s Infrared Ceramic Electric Countertop Cooker is an easy-to-use, well-designed hot plate that works reliably with just about any pots and pans. The heating element both heats and cools quickly, and the glass surface is very simple to clean and won’t get covered in food if you’re using it every day. While it doesn’t have the highest wattage of any hot plate on the market, its ease-of-use and efficient design make it an excellent buy. Heats up quickly. Users love how quickly the NutriChef Countertop Cooker heats up very quickly and maintains steady heat. This makes it ideal for both cooking meals and keeping dishes warm over a longer time period. LCD screen makes it simple to use. The LCD screen on this hot plate makes for intuitive operation. Reviewers like that they can quickly set temperatures and access presets. Glass surface makes cleanup quick and simple. The glass surface of the NutriChef Countertop Cooker is very simple to clean up, which users confirm saves a lot of time and effort. Some users may want higher wattage. The NutriChef Countertop Cooker is a 1200-watt hot plate, which a handful of users find slightly underpowered. If you’re looking for a hot plate for commercial or industrial applications, you will likely need a higher-powered model. Limited number of temperature presets. While the LCD screen does make accessing preset temperatures simple, some users find that they want more than eight presets for frequently-used temperatures. 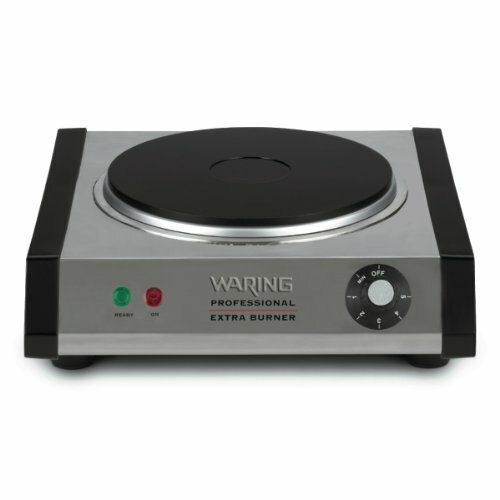 Waring’s 1300-watt SB30 is a well-designed, sturdy hot plate that performs very well, especially if you need to maintain a steady temperature for long-term use or everyday cooking. It takes some time to fully heat up, but gets hot enough to rapidly boil water. The build quality and ease-of-use are big selling points for this portable burner: it’s durably constructed so you can use it wherever you go, and the temperature settings and indicator lights are straightforward and simple to understand. Even heat for cooking and boiling water. The Waring SB30’s flat cast iron cooking surface heats evenly, which is perfect for both cooking and heating. Several users say it works particularly well for boiling water. Built to last. Several reviewers single out the build and material quality of the Waring SB30. It offers durable stainless steel construction that can withstand frequent travel and use. Temperature adjustments are simple and intuitive. Users also like the intuitive temperature dial and indicator. Separate power and temperature lights let you know at a glance when the hot plate is on and when it’s ready to cook. Slower to heat up. One recurring comment from users is that the Waring SB30 is somewhat slow to heat up. While it will maintain a steady temperature once it reaches full heat, it takes several minutes to get there. Relatively expensive for single burner. A few users also mention that this hot plate is significantly higher-priced than other single burners, even considering the quality construction and performance. 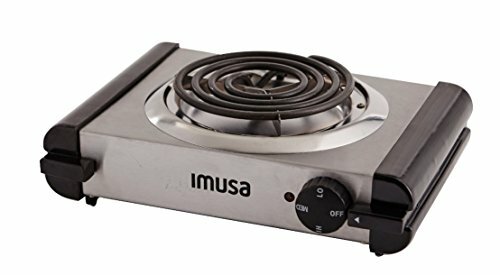 IMUSA’s Electric Single Burner hot plate uses a classic coil design, but incorporates several features that really set it apart from competitors in this price range. It heats up incredibly quickly, and at full power can boil water in a few minutes. It also has several added safety features, including an automatic shutoff function and carrying handles, along with a lightweight design that makes this hot plate easy to take anywhere you go. Heats up quickly. This hot plate gets up to temperature very quickly, which users note works very well for boiling a pot of water or cooking a meal. Several excellent safety features. For a budget hot plate, the IMUSA has several safety features that users appreciate. The side handles prevent burns while the unit is heating up, while the automatic shutoff feature reduces fire hazards. Lightweight and compact design is very portable. Reviewers also find the lightweight design extremely portable and convenient. This provides extra utility if you’re bringing this hot plate camping or to a gathering of friends. Coil provides somewhat uneven heat. Because it uses a heating coil, reviewers find that this hot plate can have hotter and cooler spots, which can cause problems if you’re cooking something that requires consistent heat. Automatic shutoff can be frustrating. Some users find the automatic shutoff feature more frustrating than convenient. It can make temperature adjustments more difficult than they need to be, or cause the hot plate to turn off while still in use. 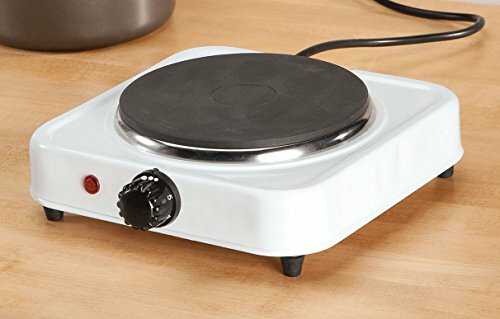 The Home Marketplace White Solid Single Top Hot Plate is a very simple, straightforward electric burner that uses a flat griddle-style design to evenly distribute heat, giving users more precise control over cooking temperatures than a coil design. The simplicity of this hot plate means there aren’t too many extra features, but this affordable hot plate does heat quickly and has enough power to both heat and cook meals. Straightforward operation. Reviewers like the simplicity of this hot plate: there’s one knob to set the temperature level, and an indicator light to let you know when the heating element is on. Flat top provides even heat. The flat top design heats pots and pans evenly, which is a great feature at this price point. Several reviewers note that it can keep a container of water warm without losing heat or overheating. Surprisingly sturdy construction. Many reviewers find this hot plate surprisingly well-constructed, especially considering the price point. It’s made of steel and iron that hold up to frequent use and can withstand travel and storage. Light on features. If you’re looking for programmable temperature settings and other advanced features, this hot plate probably isn’t your best bet. It’s an effective hot plate with very few extras. If you’re hosting a party or cooking for a family holiday, you may want a hot plate with extra capacity for preparing and heating several dishes at once. 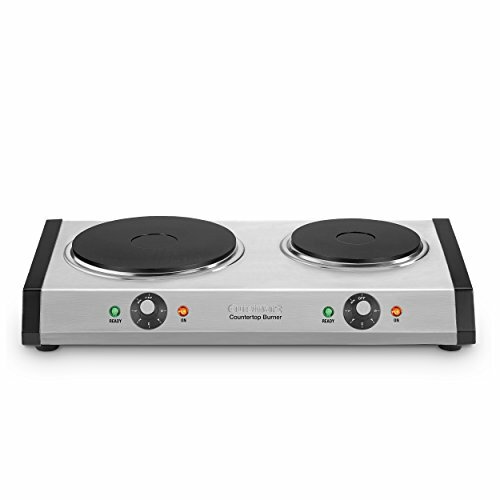 A double burner hot plate will usually have two separate heating elements, each independently controlled so that you can set them on different heat settings. Some also pair a “simmer” burner that operates at a lower heat to keep food warm with a full-powered burner that can be used for meal prep and higher-temperature cooking. Cuisinart’s Cast Iron Double Burner is an excellent choice if you’re looking to add extra cooking surfaces or want a versatile hot plate for travel and entertaining. The large burner offers a lot of power, which is ideal for cooking food and boiling water, while the smaller, lower-powered burner is perfect if you want to maintain a steady temperature after preparing food. The cast iron surfaces conduct heat very evenly, which definitely adds to this hot plate’s utility. Burners heat up quickly and evenly. Both of this hot plate’s cast iron heating elements get hot quickly and provide even heat. Reviewers find them very reliable (especially the larger burner). High-quality construction. 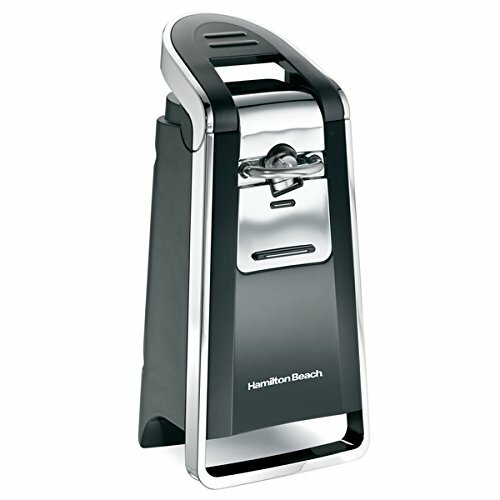 Most users agree that the Cuisinart CB-60 is very well constructed. It’s made of durable stainless steel, with cast iron burners and sturdy temperature knobs that are designed for frequent use. Flat top design is easy to clean up. This burner is also very easy to clean up, with users able to simply wipe down the heating elements between uses. Cast iron cooktops are prone to rust. One potential issue that users mention is the tendency of the cast iron burners to rust if they get wet. This can be avoided by ensuring that the cooktop is dried after every use. Lower-powered burner is not ideal for cooking. Users sometimes find the smaller burner frustrating. Since it’s only a 500-watt burner, it’s not designed for cooking, but instead for keeping dishes warm or at a simmer. The Ovente Countertop Burner offers stainless steel and glass construction that provides great longevity and performance, along with easy cleanup and a very portable design. Each of the large burners can accommodate a full-sized pot or pan and is designed to provide steady, even heat without cold or hot spots. However, users find that running both heating elements at once can negatively impact cooking speed and power. Provides even heat. The glass and ceramic heating elements provide very steady and even heat. 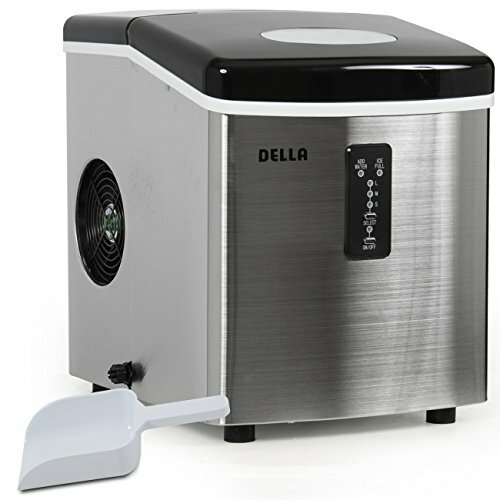 Reviewers find this very useful for applications that require precisely maintained temperatures, such as while making candy. Larger burners can fit big pots and plans. 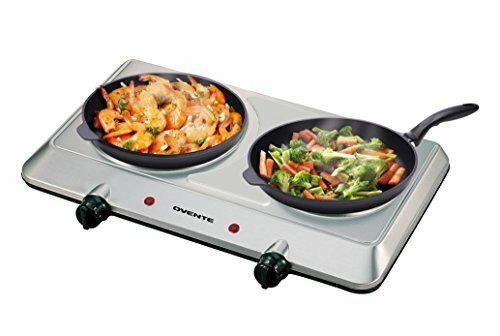 Several users also mention the size of the burners as a positive: unlike some double-burner hot plates, the Ovente Countertop Burner has two full-sized heating elements. Glass top simplifies cleanup. Reviewers love how easy this hot plate is to clean up: because it has glass surfaces, you can quickly wipe it down without worrying about crumbs or rust building up. Slow to heat up. Several users mention that this hot plate takes a very long time to heat up. This can be frustrating, especially if you’re trying to heat up water or cook a meal. Not as powerful when both burners are on. With both burners on, users have a very hard time getting this hot plate to full temperature. Reviewers note difficulty boiling water and cooking while both elements are on. Induction hot plates offer more precise control over burner and food temperatures, but don’t work with all pots and pans. These burners work through induction, which utilizes a magnetic field to produce heat. However, this means it will only heat pans that contain iron, which can be somewhat limiting. For many users, the benefits of more precise temperature control and faster heating (since there’s significantly less heat loss than in gas or electric burners) outweigh this limitation. 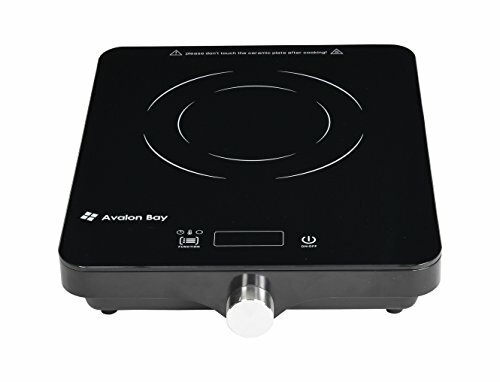 The Avalon Bay Induction Cooktop is a great buy for users seeking a more efficient alternative to a conventional electric hot plate. It uses magnetic induction to rapidly heat iron and steel pots and pans, and has a number of user-friendly customization features. It offers eight temperature settings, eight power settings, and a digital display, which can help you precisely monitor heat and make adjustments while cooking. Induction provides incredibly fast heating. The heating technology in the Avalon Bay Induction Cooktop is very efficient. Users report that it can boil a pot of water in about three minutes, which can really cut down cooking time. Accurate and responsive temperature settings. Several reviewers also mention this hot plate’s high level of accuracy when it comes to setting temperature and power. This gives users a lot of control and the ability to quickly adjust temperatures. Clean and portable design. Many users also appreciate the compact design of this induction hot plate. This makes it very easy to take to events and parties, and the induction burner even works outside. Doesn’t work with all pots and pans. Because it uses induction technology, this hot plat will not work with every vessel. It does have a built-in detector that will tell you if you’re trying to use an incompatible pot or pan, however. High-power mode can cause circuit breakers to trip. One user warns that using the 1800-watt setting on this cooktop can cause circuit breakers to trip if multiple devices are plugged in on the same circuit, although no reviews mention encountering this problem. The Nu Wave 30603 Electric Countertop Burner is a very powerful induction hot plate that offers two efficient induction burners that can both reach very high temperatures for cooking and heating meals. It also provides an incredible degree of precision when it comes to setting temperature and power levels. 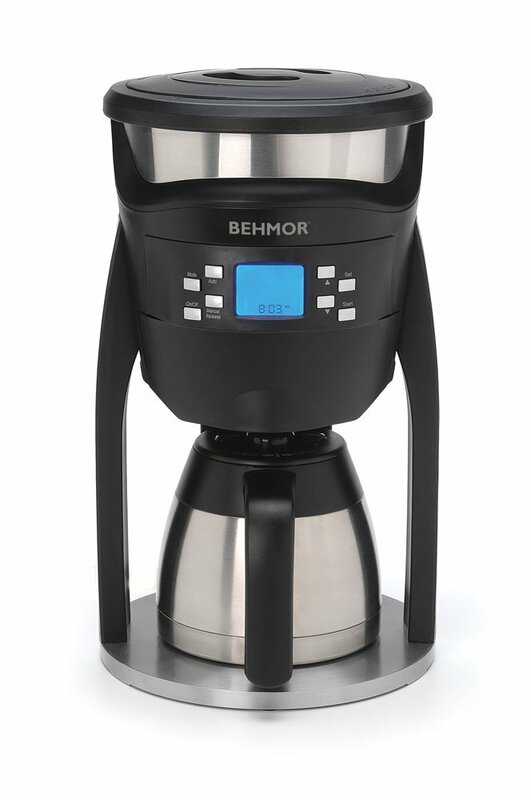 While its high number of buttons and features may be somewhat imposing for novice users, its combination of versatility and power make it a great choice for everyday use. Highly efficient burners are also very customizable. 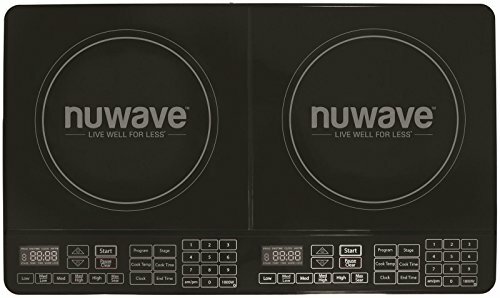 The Nu Wave 30603 gives users a lot of control over every aspect of cooking, from temperature to cook time and power level. This level of control, combined with the efficient induction technology, can really cut down on cooking time. Excellent safety features. The Nu Wave 30603 has several great safety features. 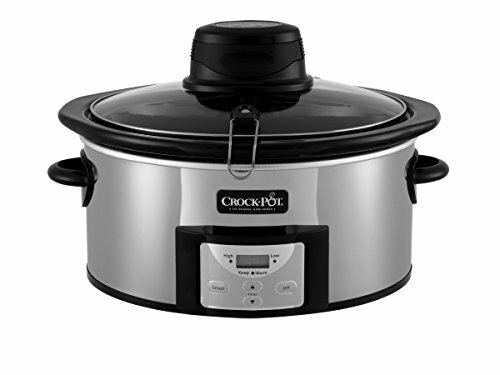 User reviews specifically mention the automatic shutoff feature, which is tied directly to the induction technology: the heating element begins to power down when you remove a pot or pan. Durable construction is great for RVs and camping. Several reviews mention the durable construction, specifically mentioning that this hot plate travels well in RVs and on camping trips. Settings can take some time to learn. With so many customization options and cooking settings, there is a bit of a learning curve when it comes to using this hot plate. Several users mention some early difficulty with learning to use the Nu Wave. Black surface picks up stains and grease. A few users note that the black glass cooktop tends to show grease and moisture stains, so you’ll likely need to clean this after every use.